1 of 5 Heat oven to 325 degrees. Line 16 cups of 2 muffin tins with paper or foil liners. Blend flour, baking soda, salt and baking powder in a bowl. 2 of 5 In a large bowl, beat butter and sugar. In a separate bowl, beat cream cheese with 1/4 cup of the boiling water. Beat eggs, one at a time, into butter mixture, beating well after each addition. Beat in vanilla. 3 of 5 On low, beat in half the flour mixture, then the cream cheese mixture, followed by remaining flour mixture. 4 of 5 Remove 1 cup of the batter to a small bowl. Whisk remaining 1/4 cup boiling water into cocoa powder. Fold into smaller portion of batter. 5 of 5 Fill cupcake liners half full of vanilla batter. Divide chocolate batter evenly among cups. Swirl with a knife. Bake at 325 degrees for 18 to 20 minutes. Cool on a wire rack. 1 of 1 Beat butter and cream cheese until smooth. On low, beat in confectioners' sugar, milk and vanilla. Separate 1/2 cup of the frosting and place in a resealable plastic bag. Tint remaining frosting green. Transfer to a piping bag fitted with #233, #234 or star tip. 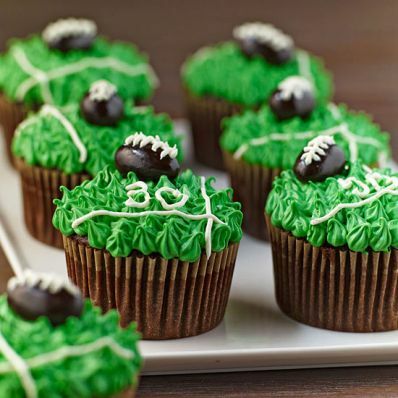 Pipe onto cupcakes to resemble grass (alternately, spread green frosting onto cupcakes). Snip a tiny corner off bag with white frosting and pipe lines and numbers on cupcakes. Place a chocolate-covered almond on each cake and pipe on laces with white frosting.